Two days ago, equity markets worldwide were spooked by Italian political turmoil and possibility of a euroskeptic government that will drive Italy out of euro. The S&P 500 fell 1.2%. 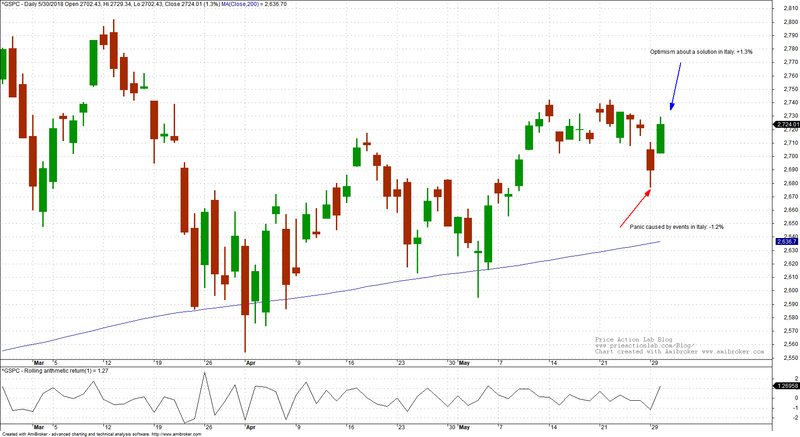 Next day, according to financial media, the market rallied 1.3% because of optimism. I hope no one believes these narratives. Here is how markets work, more or less. Markets are not purely event-driven. They are also algo-driven. Many algos do not even pay attention to fundamentals but only to price and volume. 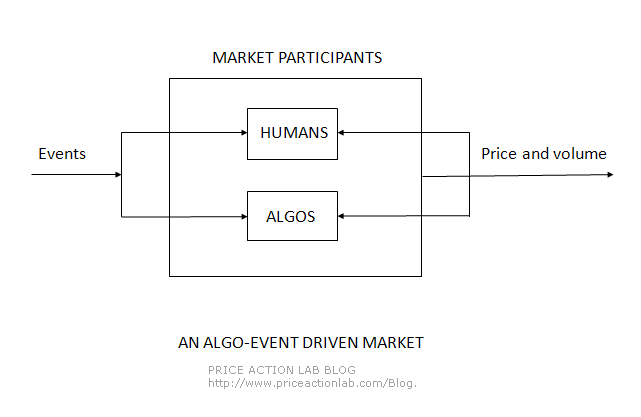 Human and algo decisions combined drive markets. But this general scheme is more complicated than that. The financial media is still trying to explain price action by assuming humans drive decisions, which is a remnant of the past. This is now 2018. Most journalists have no idea how this market works. I do not blame them for that but at least they must try to get up to speed. Easy explanations are usually wrong otherwise everyone would be rich and that is impossible of course. There are two general types of market participants: humans and algos. Chart and recreational traders usually provide the profits to tactical and strategic traders. Momentum traders usually profit from strategic and tactical investors that panic during major corrections and from chart and recreational traders due to longer timeframe timing ability. I say “usually profit” because this depends on several other factors that are beyond the scope of this short article. Note that human participants may be using technical or fundamentals, or both. High frequency Trading (HFT) usually acts as the market maker but without any obligation to provide liquidity and as a result flash crashes are possible. But the idea is that if there are many HFT algos, then there will not be any major liquidity problem, which is a rather shaky assumption. Predatory algos attempt to shake out weak hands: chart traders and other random market participants. It is also beyond the scope of this article to discuss how these operate but they started in the 1990s when some smart mathematically oriented traders realized that technical analysis was a random trading method. Predatory algos have been quite effective and profitable. Statistical arbitrage, long/short equity and idiosyncratic alpha algos are used by sophisticated market participants and hedge funds. Usually fundamental events play little role in their decisions although some look at social media sentiment but they may go along with it or against it. Using machine learning to develop this type of algos is where current research concentrates. As it may be seen from the above figure, the market is a rather complex environment. Although the main input consists of developments in the form of events, the output, which is price and volume of securities, is also an input to both human and algo traders. This is a highly non-linear stochastic feedback mechanism that can generate even chaotic modes. Depending on the intensity of the feedback, fundamentals may lose importance and price action may appear to fade them. This is usually perceived as reversal in sentiment by journalists but this is not how things work. For example, in the case of recent Italian turmoil, only the naive could assert that the situation was rectified in just one day. This is a fundamental development that has taken years to reach a peak point and the risks cannot be removed in just one day. What happened yesterday was that many random traders, mainly chartists and other random participants, went short in hope of making a quick profit. The predatory algos squeezed them out. The fundamentals played no role. No sophisticated investor is in a hurry to drive the market down, only the small account traders hope this will occur and they usually lose. At the same time, journalists try to explain the reversal in terms of change in sentiment, something that is far from the truth.